An optimum area of application of the DMT lathes is the production of individual parts and small series. Performance, flexibility and high precision characterise our cycle-controlled machines. 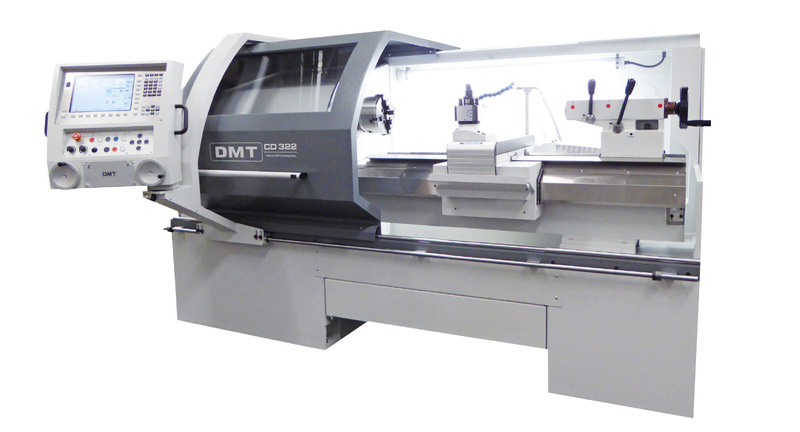 All DMT lathes guarantee optimum handling. They are easy to program and use. Simple operations can be performed in the usual manner with the hand wheels; for more demanding parts, a program is created on the controller, a program previously saved on the controller is activated or an external program is imported. Accurate components, precision bearings, ball screws and careful assembly with permanent monitoring guarantee precisions that are considerably better than the values set down by the corresponding standards. Finely ground guides, proven material combinations (no plastic coatings), adjustable wedge bars, lubrication with dosing piston distributors and guidance track covers guarantee that basic precision is retained for the long term. The machine equipment can be fully designed for individual requirements. A Multifix tool carrier is part of the basic equipment. Depending on the purpose of use, quadruple tool holders, automatic tool revolvers, driven tools or special tools can be attached. The controllers of our machines are among the most modern of their class. User-friendliness, interactive programming and ergonomically advantageous handling guarantee a first-class workflow. All controls are in an ergonomically advantageous position outside of the chip range and offer optimum accessibility to the work area. Guard door cover the work area and prevent the escape of chips and coolant. As further protection for the operator and environment, coolant spray can also be suctioned from the work area and cleaned using effective air filters. Extensive consulting before and intensive care after purchasing are a matter of course at DMT. If a malfunction occurs on your machine despite all preventive measures, our customer service is available to you fast for telephone inquiries and on-site service.